I was pretty much bowled over by last week's first episode of Batman: The Brave and The Bold, with its pop-art combination of fun, action and villains with cosmic-powered gongs for weapons, but this pic from Friday's second episode promises that even better is to come. 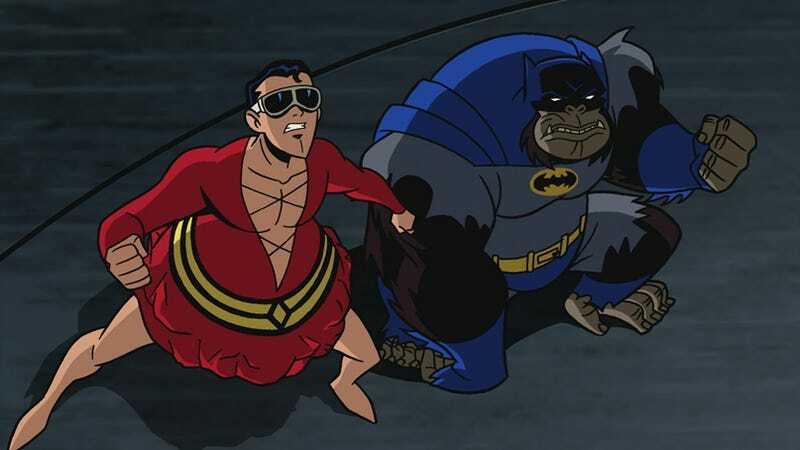 Yes, that's Batman turned into an ape, ready for action beside Plastic Man. And if you need more evidence of the show's greatness, look below for a second picture of awesome. Because Bat-Ape wasn't good enough, the episode also features Batman versus a T-Rex. Seriously, what else do you people need from your television? Batman: The Brave And The Bold is on Cartoon Network Fridays at 8pm.